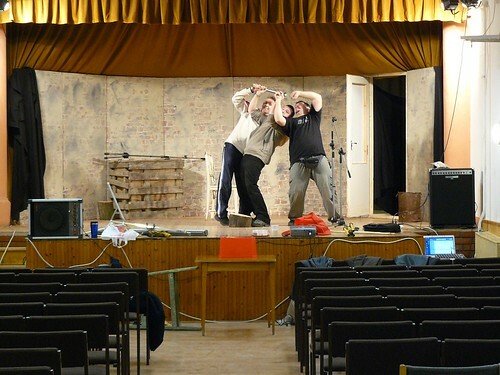 Above: Video clips from Saturday's Underground Christmas Musical in PetÅ‘fibánya's neighboring town of Selyp. We praise God that the set up, practice and production went without problems! I was thankful to be able to see the show firsthand, as I was in the US on furlough when it was presented in December. The story is about a Jewish family in hiding in a basement and their run in with a wounded Christian soldier who becomes a redemptive figure. Although you won't be able to understand the words in the video above, you can definitely sense the emotion and power of the musical from the short clips. 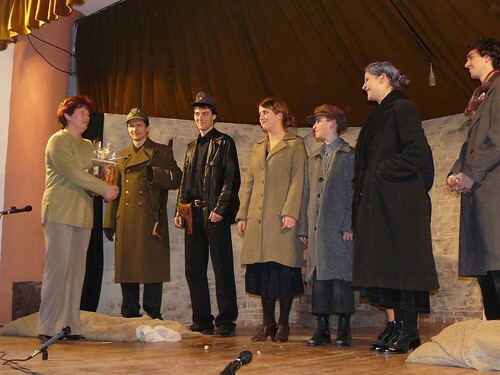 Above: Teenagers Gabi K., and Zoli joined Miki, Dezsô and myself to set up the lighting, sound and stage props. It is great to see these young men getting more involved in various ministries of our church. They have been faithful with a little and we are inviting them to become more involved in a Friday night teen outreach ministry. Please pray for Gabi K. and Zoli as they grow in their faith. Above: Over 40 people attended the Musical (I didn't really have a chance to get an accurate count). Each of them received a program which clearly outlined the Gospel. Please pray that God would continue to draw these men and women to Himself. We have been taking steps over the past 2 years reaching out to this town. 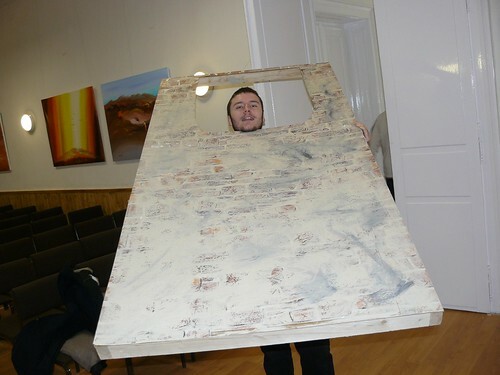 It seems as if Selyp (Shape) will be our next target area for a church plant. Above: We thanked the woman responsible for allowing us to use the Community Center in Selyp and offered her a small gift of appreciation. She said that even though she saw the show on DVD, she was in tears throughout the live presentation. Today as Miki and I packed up the stage in storage, she added that everyone was thankful for the show and that she would love to have us return again. These type of relationships that God is creating give us greater opportunity for outreach as we do more evangelism in Selyp. Before the Musical on Saturday, multiple Pioneers teams converged in PetÅ‘fibánya to pass out hundreds of brochures for this years English Camp and English program in PetÅ‘fibánya. As Pioneers fine tunes the English Camp, we are focusing on specific areas where there are current church planting works happening. This gives us greater opportunity for follow up and sustained growth of those who are saved at camp. Please pray for many new students from our area to attend camp and that God would reveal His Son to them there. Above: DezsÅ‘ preached from the first chapter of Romans on Sunday. He spoke about Paul's example of not being ashamed of the Gospel, being convinced of the truth of the Gospel and Paul's passion to preach the message to all. It is encouraging to see his growth and how God continues to develop his spiritual gifts for the building up of the body. Above: We celebrated Zoli's 19th birthday after church service. 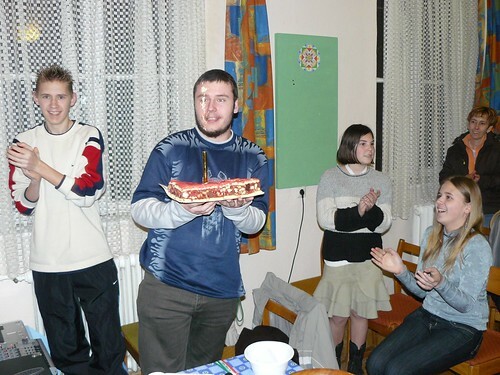 His mother and grandmother were kind enough to bring the traditional birthday cake with a flaming sparking candle. We were thankful for a response from the many handouts advertising our English classes in Selyp. God answered our prayers! We gained three new students and have filled up our beginner and intermediate classes. Above: Anett on the far left and Rihárd to her right are two new students to Heidi's beginner class. Sanyi (Shawn-yee) (not pictured) is also new to our English program. 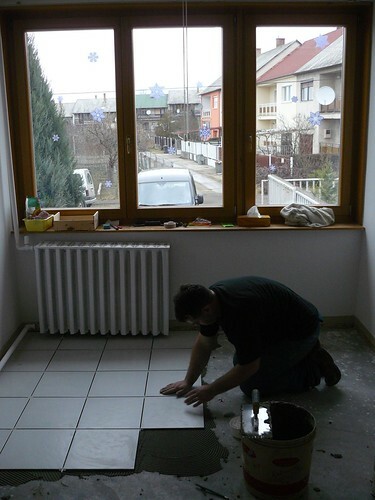 Sanyi, who lives in PetÅ‘fibánya was just at my house last week installing pipes in our kitchen. He has a son in the same preschool as Ben and Ellie and a daughter who has attended our VBS in the past. Unfortunately, none of these three new students attended the optional Bible study afterwards. Please pray that God would do a miraculous work in their hearts and draw them to Himself. Above: Brenda's intermediate class grew from one student last week, to a total of four students. Bondi who attended last semester is now bringing his fourteen year old son. Both of them stayed for the Bible study. Out of the seven students that stayed after for Bible study, four are saved and members of our church. The remaining three are in different stages of seeking. Tonight we started with the question: Does God exist? We explored the viewpoints of the atheist, the agnostic and the believer. Please pray that even more students would stay after as we begin to study the life and teachings of Jesus Christ. - Our first Puppet practice went well. This year's Easter team will be Janka, Miki, Hugi and Allen. - The Christmas Musical drew many from the town of Selyp to hear a message on reconciliation and redemption. 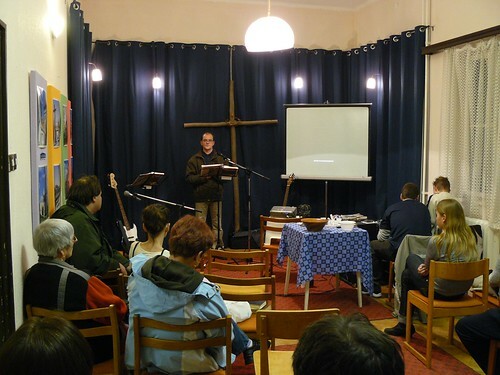 They all received a printed explanation of the gospel. - People responded to the posters and invitations passed out for English classes and some stayed after for the optional Bible study. - Financial Needs. Various supporters have responded in generous ways. We are once again overwhelmed with your kindness. - Residency Permit progress. We are close to having most of our paper work together to turn in this week. Residency Permits: Please continue to pray for us as we turn in our papers this week. Please pray for success in getting five year permits. 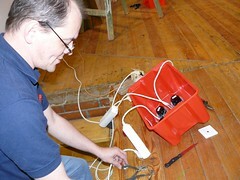 Puppet practice: Please continue to pray for us as we fine tune our parts in the show. 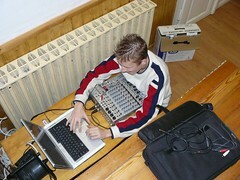 Please also pray for God to help us with learning the drama for this years outreach. VBS planning: We hope to meet with various team members this week to begin planning of our Vacation Bible School. We are in need of God's wisdom and provision to have a VBS this year. Sickos: Whatever sickness we have is still lingering and causing discomfort at night, which disrupts our sleep. Please pray that our family would be healed completely and that we would be able to sleep through the night. 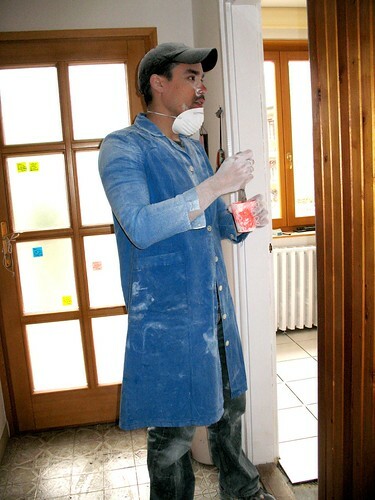 Above: Allen after thoroughly sanding Elianna and Kira's bedroom. We have passed the two week marker since returning to Hungary and are steadily making progress in unpacking and setting up our new home. Last week, sickness took aim at each one in our family as we have gone through sore throats, fevers, croupy coughs and interupted sleep. By God's grace, we seem to be getting better. Please continue to pray for complete healing. 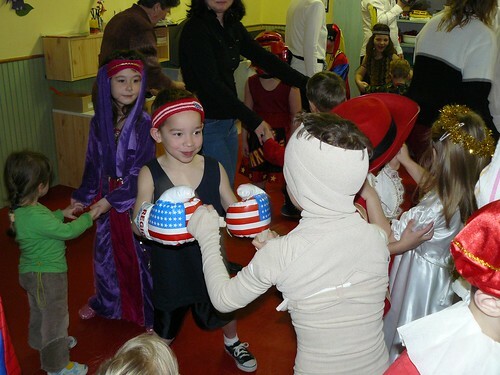 Above: Ben celebrated Farsang (similar to Halloween) with his preschool by dressing up as a boxer. Sharon suggested a bathrobe to complete the look, but Ben had trouble believing that a boxer would wear something as ridiculous as that..oh well. Both Ben and Elianna are adjusting well to being back in Hungarian school. 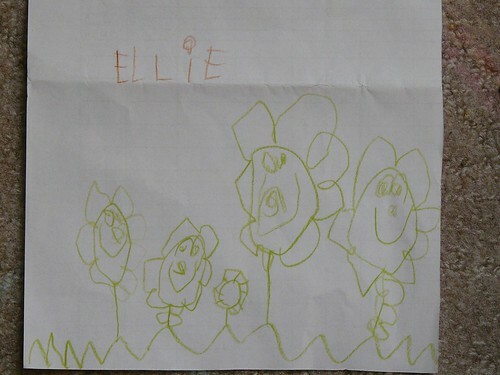 Elianna's pictures that she draws in class are thankfully full of happy faces and not scribbles of frustration. Ben has been ice skating twice a week with his class and was overjoyed at being able to cross the rink by himself without falling. Go Ben! 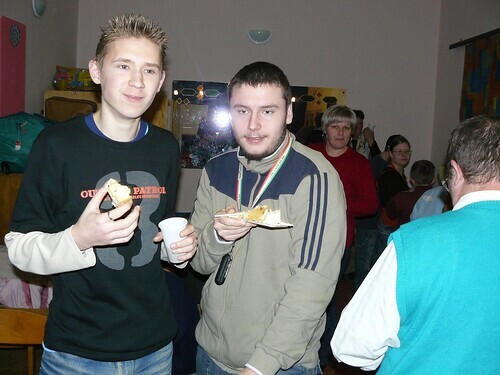 Above: Teenagers Gabi K. and Zoli. On Friday night I spent time with teens playing fuseball. Our church hopes to purchase an additional foosball table as these tournament nights are drawing both teenage girls and boys together off the streets. We hope to use this time to develop friendships while sharing the Gospel of salvation with them. The doctor has said that in this stage of cancer, it will take a miracle for Julika to survive. Thankfully, our Father is known for performing such miracles. Would you pray for God to grant a miraculous healing in Jukika's life? Before service on Sunday, some of us gather for a concentrated time of prayer. I can remember a few years back when only our team participated. What an encouragement to see that today we had just as many church members as team members praying. In the time we appoint for personal testimonies, Lidia shared about how God had been giving her strength, comfort and provision since the recent miscarriage of her first child. 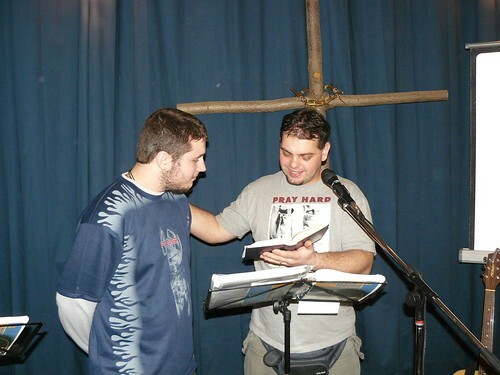 DezsÅ‘ (above) shared about his recent struggles that almost led him to beleive that it was time to give up. He shared about God teaching him the importance and value of perseverance. Above: Peti continues to preach every other week and will be joining our church and church planting team leadership. 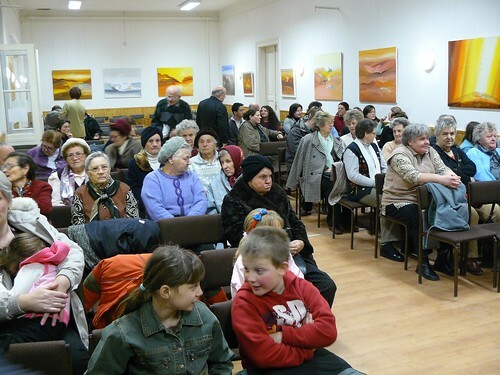 We praise God for those He is sending to plant and harvest in this needy area of Northeastern Hungary. 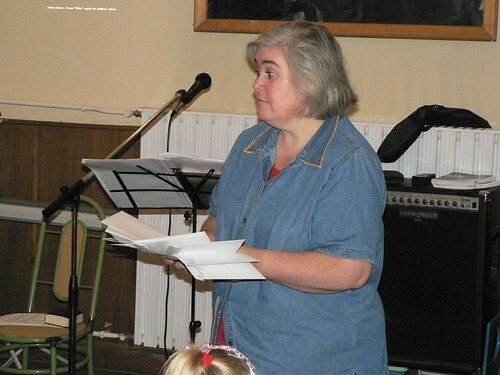 Above: Miki's wife Erika teaching Sunday School. 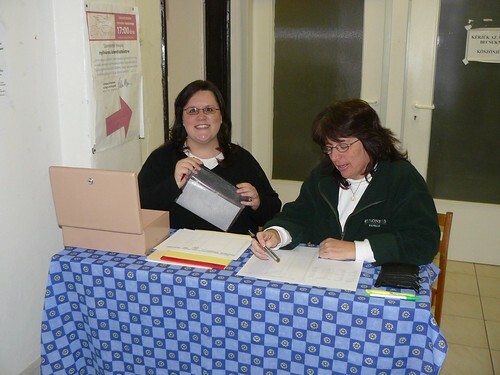 Above: Brenda and Val preparing to take on the rush of people registering for ESL. O.K., so there was no rush, but they were still ready for it. We believe that because of sickness of students and lack of widespread advertising, not many people showed up the first night. We will be hanging up more posters this week and hope for full classes next week. Above: For those that did come, Roger and Heidi (above seated left) planned an ice breaker game. Above: We were thankful to see Csilla come to begin a new semester with us. Csilla heard about our program through her teenage son who attended our classes and our camp in the past. She was also one of the students that often stayed after for the optional Bible study. Please pray for God to draw her to Himself through this ministry. Complete recovery from sickness. Sharon, Kira and Allen are still in different stages of whatever is going around here. Our Puppet and Drama ministry is just around the corner and we will hold our first practice this Wednesday and Friday. Please pray that God would equip us to carry out His gospel faithfully. On Saturday, we will be showing the Christmas Musical in the neighboring village of Selyp. Please pray that all those involved from actors to those setting up would be protected from the enemy and that we could present this show for God's glory. 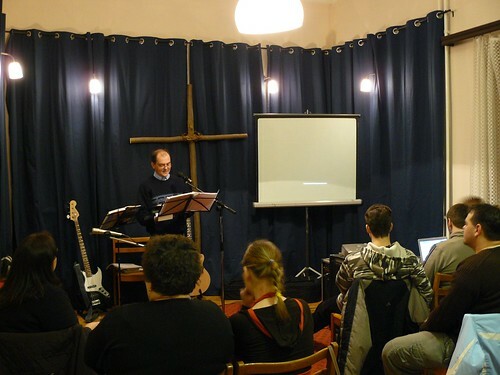 The program will have an explanation of the gospel with accompanying verses. Please pray for many to come to understand the message and receive Jesus as their personal Lord and Savior. ESL will continue every Monday. Please pray for people to respond to the posters and invitations so that we can have full classes. Pray also for students to be drawn to stay after for the optional Bible study time. Financial Needs. We are still trying to financially recover from our time living in the States when we had extra expenses of renting a house, a car and overall higher living costs. We also have current financial needs in setting up our new house in PetÅ‘fibánya. Please pray for God to provide. Residency Permits: We will be filling out a lot of paperwork and traveling to complete the renewal of our residency permits. Please pray for success in getting five year permits. Wisdom with future schooling chooses for Ben. Please pray for us to find the best education for Ben and for whatever application process that would entail. We need to decide pretty soon so that he is all set for first grade. Above: The kids having fun finding some dress up clothes as we continue opening piles of boxes. The local preschool celebrates Farsang (far-shawng) this week where all the kids dress up and perform a show full of poetry, song and dance for parents. Ben is missing finishing parts to each of his costumes, so he is having trouble putting something together. I saw him the other day running around in a storm trooper outfit combined with a black suit jacket and cape. 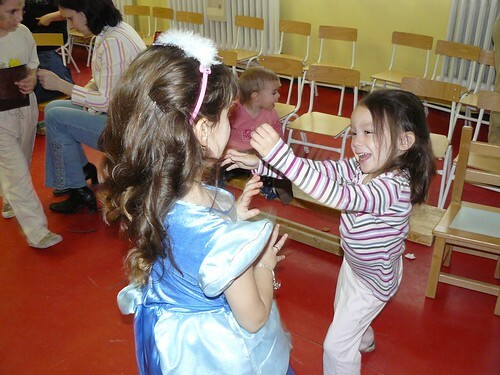 Elianna is looking forward to wearing her princess dress. Above: Sharon attacking Kira with tickle fingers after sorting through boxes of clothes. This is the room where all three kids are sleeping temporarily as we finish sanding, painting and preparing other rooms. 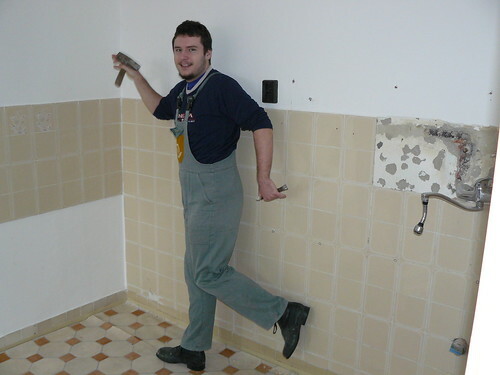 Above: Miki helping us put tile flooring in our kitchen. This has given us lots of time to catch up as we work together. We are so thankful for his help! 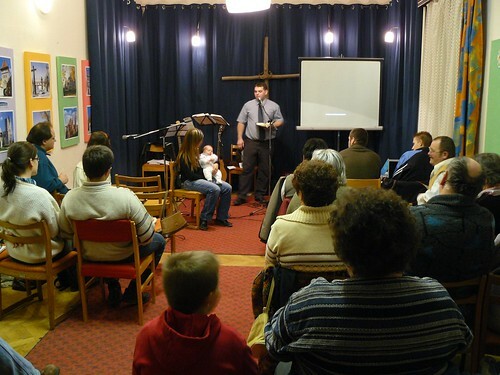 Above: Dedicating Eszti's child to the Lord in Sunday's worship service. I was thankful to meet Érzsi, an older woman who has been attending our church with her son since an Advent wreath outreach in December. She told me that there was something different about our church, in that we not only learn about God's word, but live it out in community. She said there is life in the church. 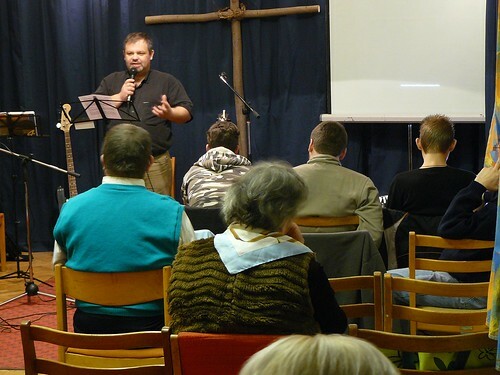 We praise God for drawing more people in the community to Himself. As you can imagine, we are in need of God's strength in this time. Here are some things you can pray about. 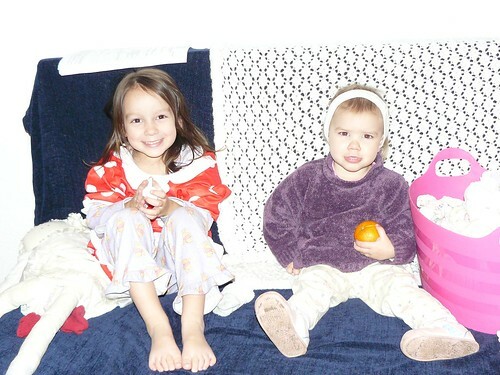 • Allen, Ben, Elianna and Kira are sick. 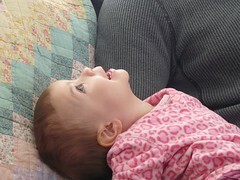 Elianna awoke two nights ago with a terrible croup cough which leads to difficulty in breathing. This type of sickness usually leads to 3-4 nights of the same difficulty in breathing. We praise God that last night, she did not suffer in this way. Please pray for our complete physical healing and for the ability to sleep through the night. • Our house is still in need of work that we hope to complete in the next few weeks. 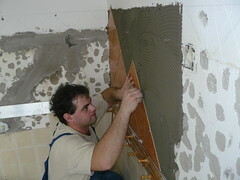 We could still use help with one time financial gifts to finish the work. • We are in the process of renewing our Hungarian residency permits. This means travel to different areas of Hungary, lots of paper work and the need of approval from various officials. Please pray that we would receive a 5 year residency permit. • English classes and Puppet and Drama ministry are about to begin. Please pray for God to guide our team in these ministries, giving us wisdom, strength and protection from the enemy as we seek to use them for His glory. • Church and team leaders. Please pray for Miki and Allen who have various important decisions ahead of the regarding the church and the team. Above: All packed up and ready to fly to Hungary. 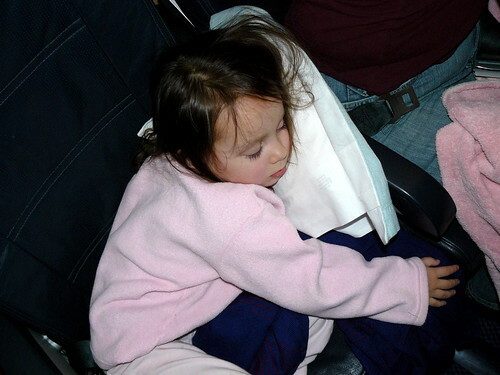 The flight to Hungary was rough on the plane, but gracious to us! There were high speed tailwinds that hurried our plane to London. The landing in these winds felt like each wing had a bungee cord being yanked in opposite directions. Upon landing, the plane dramatically swayed left and right as the 50-70 mph gusts made themselves known. We praise God that these same winds delayed our flight out of London to Budapest, giving us extra time to get to our gate with three sleepy kids, two sleepy parents and three heavy bags. We asked for prayer for our bags to come in without a problem (that would be 23 bags), and for ease in going through customs. All bags were accounted for (under quick transfer conditions) and for the first time I've ever seen, there were no officers in the customs hallway where we exited the terminal...Praise God! We were thankful for various PI friends meeting us at the airport, helping us transport our stuff and even sending a care package to get us through the first few nights. 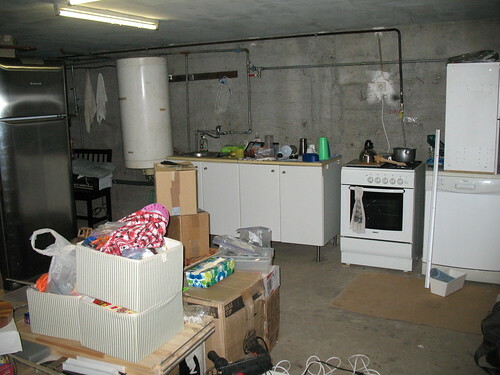 Above: Our temporary kitchen set up in our basement. We have been rapidly unpacking and setting up our house in a manner that allows for renovation to be completed. Miki, Erika, Dezsô, teenagers Zoli and Gabi have spent a lot of time helping us out. We are so thankful for such friends that help the transition to go so much easier. Above: Zoli about to demolish part of our kitchen. What fun. 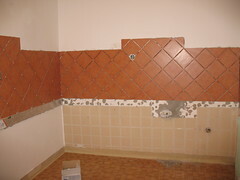 Above: Miki spent the day installing tile on our kitchen walls. Benjamin and Elianna attended preschool today for the first time since we've been back. On the way over, Elianna said, "Dad, why is preschool only fun at Farsang?" 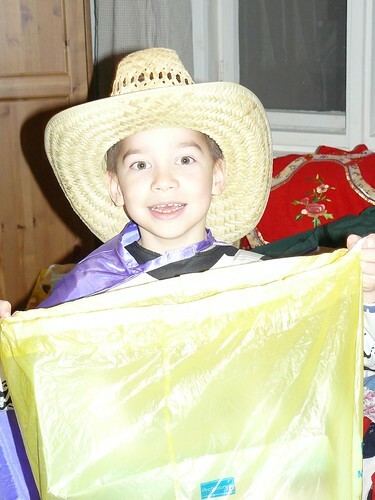 (Farsang is a celebration similar to halloween in the States). Ben said, "No, it's not only fun them, it's always fun. 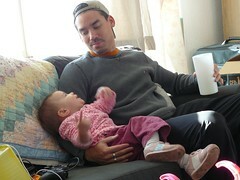 We get to play with our friends and play games..." I was thankful for Ben's encouraging words to Elianna. They were both greeted with smiles and hugs from their teachers. After school, Elianna told me that she made three friends. Ben took a field trip ice skating. They both had a great time. We would appreciate your continued prayers for them in this time of transition. We are currently sick along with the majority of our team and some of the children. Please pray that we would be able to get adequate rest and that God would heal us from sickness. Thank you for your prayer support. It truly means a lot to us!